PICKERINGTON, Ohio -- The Renewable Fuel Standard volume requirements announced today by the U.S. Environmental Protection Agency increase the risk of inadvertent misfueling for motorcyclists and all-terrain-vehicle owners by mandating the widespread availability of higher-ethanol fuel blends, such as E15, the American Motorcyclist Association reports. Although the EPA Renewable Volume Obligations under the RFS are lower than the statutory requirements, the EPA's decision still means more ethanol must be blended into the nation's fuel supply during the coming year. The EPA set the renewable fuel standard for 2014 at 16.28 billion gallons. For 2015, the standard is 16.93 billion gallons. And for 2016, the total increases to 18.11 billion gallons. Those volume obligations are higher than the EPA's initial recommendations issued in May, when the EPA proposed setting the renewable fuel standard for 2014 at the levels that were actually produced and used, which totaled 15.93 billion gallons; for 2015 at 16.3 billion gallons, and for 2016 17.4 billion gallons. "We are extremely disappointed that the EPA bowed to pressure from the ethanol industry and agreed to foist more ethanol onto the backs of American consumers," said Wayne Allard, AMA vice president of government relations. "Any increase in the amount of ethanol required in our fuel supply, coupled with America's decreasing demand for gasoline, is going to result in higher-ethanol blends, such as E15, at more pumps and stations. And the widespread availability of E15 and higher-ethanol fuels increases the risk that motorcyclists will inadvertently misfuel their bikes." E15 fuel is a blend of 85 percent gasoline and 15 percent ethanol and represents a 50 percent increase in ethanol over the common E10 blend most Americans currently use in their vehicles. By increasing the amount of ethanol in America's gasoline, the EPA will severely strain the fuel marketplace by exceeding the blend wall by hundreds of millions of gallons. The blend wall is the point at which no more ethanol can be blended without forcing consumers to use higher blends, such as E15, E30 and E85. The AMA also is concerned that forcing higher-ethanol fuel blends into the marketplace will cause E10 - which most Americans currently rely on for their vehicles - to become less available, and that gasoline with no ethanol may become virtually unavailable. The amount of E0 will go from 9.2 billion gallons to just 130 million in 2016 per the rule. "Owners of vintage motorcycles already have trouble finding E0," Allard said. "What are they supposed to do if ethanol-free fuel disappears entirely?" In addition to the RFS mandate, the spread of E15 and higher-ethanol fuels is being augmented by a $100 million matching grant program at the U.S. Department of Agriculture that is funding the purchase and installation of blender pumps at service stations in 21 states. These pumps dispense several blends of fuel and can retain as much as a quart of fuel in the delivery hose after fueling. 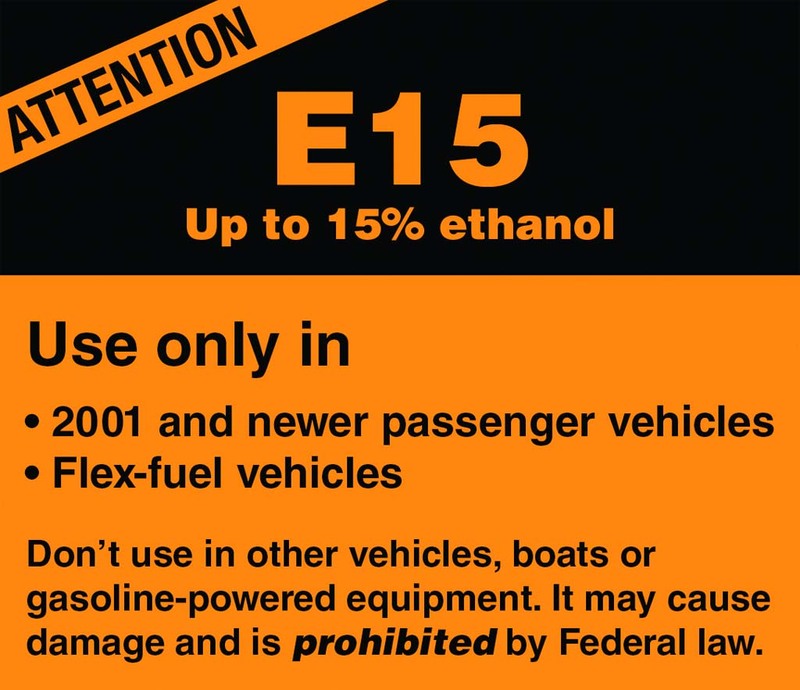 That amount of E15 or higher ethanol blends in a motorcycle's small tank creates a real risk for the vehicle owner. During the EPA's comment period on its proposed RFS rule, which ended July 27, the AMA collected 29,379 signatures on an online petition opposing the higher ethanol mandate and asking the EPA to lower, rather than increase, the standard. The AMA forwarded those signatures, along with its comments, to the EPA. The EPA's proposed standards include cellulosic biofuel, biomass-based diesel, advanced biofuels and traditional corn-based ethanol. The corn-ethanol volumes would be about 12 billion gallons for 2014, 12.2 billion gallons in 2015 and 12.4 billion gallons in 2016. A legislative fix is needed. Ask your representative in Congress to support HR 704. You can send them pre-written letters using the AMA Advocacy Center at www.americanmotorcyclist.com > Rights.